The front lines of defense against viruses, spyware and other forms of malware are your firewall and your anti-virus protection. If you’re not sure you’ve got those two important pieces of software in place, see my related articles Do I Really Need a Firewall and Free Anti-Virus Programs before continuing. The online security landscape is constantly evolving, not unlike an arms race. New threats emerge, and the software to defend against them is released. Because most users now have anti-virus software, the evil forces who create malware have turned their gaze to a new attack vector — your web browser. Bob Rankin browser security, Chrome, Firefox, IE, internet security. permalink. @Patrick G. Bryant: Internet Explorer is obsolete and has been replaced in Windows 10 by Microsoft Edge (Interesting that the survey did not include Microsoft Edge). The Windows version of Safari is also obsolete; Apple stopped supporting it in 2011, so no one should use Safari in Windows; if your Windows-based computer or laptop has Safari, get rid of it immediately. As for Opera, a new version is now available that its creators say has enhanced security and its own virtual private network (VPN) for anonymous browsing. I use Comodo’s Chrome-based Dragon and Firefox-based Ice Dragon browsers (as well Comodo’s cloud-based anti-virus). Both Dragon browsers have Comodo security features built in. I highly recommend using Dragon and Ice Dragon in place of Google Chrome and Firefox, respectively. Unfortunately, neither supports the Dashlane password manager, but they do support the Bitwarden password manager (You can import your Dashlane passwords into Bitwarden). Firefox 19, that was ages ago its 22 now lets see some up to date results please. Unbelievable that such a study would be published anywhere. This is clearly false. I mean come on, Opera with 1.87% of success ? They were among the first to implement such securities, and the mentioned security (blocking web content) isn’t even handled by any web browser developer but by a common organization tracking malicious software over the web. This is the stupidest thing ever. And unsurprisingly, Microsoft is behind it. The problem with this article is it talks about malware protection but it doesn’t actually consider security holes in the actual browser. 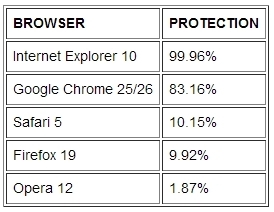 At the end of the day you can offer great protection tools in a browser, but if the actual browser has lots of holes that can be exploited the tools can be useless really. Microsoft has been known to take a while fixing these holes when it comes to IE. People complain at Google sometimes because they release many updates to Chrome but at the end of the day it means their continuously trying to make sure their browser is as safe as possible. Microsoft should take a leaf out of Google and Firefox’s book. I. E. is unsafe at any speed, this is a bogus review. To remind you: in the world of PWN2OWN, “successful attack” means that merely by browsing to untrusted web content, you’re able to inject and run arbitrary executable code outside the browser. In the real world, that means you could pull off a drive-by install, where you bypass all intended protections, prevention and pop-up warnings from the browser. If Microsoft would allow Mac users to use the latest version of Internet Explorer, I might try it out. But I like Safari and another browser you didn’t even mention: mozilla’s Camino. I don’t like Chrome. It’s too stripped down. Opera’s too slow and unreliable. Firefox / Aurora is inferior to its sister browser Camino.